6" x 48" A/O Sanding Belt 100 Grit, 10 pk. Grizzly H3517 - 6" x 48" A/O Sanding Belt 100 Grit, 10 pk. 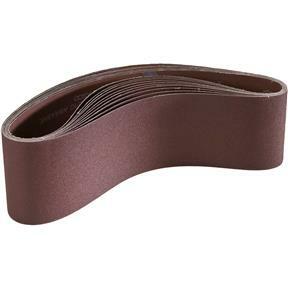 These tough Aluminum Oxide 100 grit 6" x 48" sanding belts are sized right for all of your belt sanding needs and are sold in a 10 pack. Love these belts. They stay sharp for quite awhile. Get a belt cleaner, they will lats longer. Thank you I haven't tried the belts yet I am sure they will be fine. Do yoy have sand paper 4x48 that is good for steel I sharpen my lawn mower plades on the sander it does a super good job and does not burn the blades try it some time.